1913 Bath House Inventory, p. 130, no. 649, in the safe. 1914 Wernher Inventory, p. 86, no. 433. There are a number of makers in Nuremberg with the initials HB who were active around 1560: Hans Bauch the Elder (not recorded by M. Rosenberg in Der Goldschmiede Merkzeichen, Frankfurt, 1922, III). Hans Bair (ibid., no. 3876), Hans Brabant (ibid., no. 3842), and Hans Breuning (ibid., no. 3890). The most likely is Hans Bauch the Elder, who became master in 1549 and died in 1595. Hans Bair, who became master in 1545 and is mentioned in 1579, as absent from Nuremberg, is also a possibility. 'Glory be to God. The Council and People of Nuremberg erected and made new with great honour the walls of the citadel, which were not strong enough to withstand enemy attack, both by the just addition of spaces and then by clearing away the many dilapidated buildings around the foundations. This was done for Charles V, Emperor, Pious and Fortunate, Ever August, King of Catholic Spain, Archduke of Austria etc., and for his brother Ferdinand, King of the following: Rome, Hungary, Bohemia, and the Romans, Imperial successor, etc., witnessed in deed by the councillors Christophe Tetzel, Leonard Trucher and Sebald Pfnzing, in the year 1538, in the month of August.' (Translated in M. Trusted, German Renaissance Medals, Catalogue of the Collection in the Victoria and Albert Museum, London, 1990, p. 39, no. 29). The obverse of the medal, the first of the so-called foundation medals made North of the Alps, was designed by Flotner, who was active in Nuremberg from 1523, while Johann Neudorffer composed the inscription on the reverse. The medal was cast by Hans Maslitzer. This unusual beaker is clearly related to glass forms of the period (see for example, E. Baumgartner and I. Krueger, Phonix aus Sand und Asche: Glas des Mittelalters, Munich, 1988, no. 499). Normally one would expect the glass form to follow the silver version. 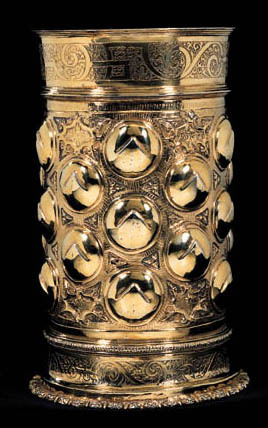 It is tempting to suggest that the medal in this beaker was perhaps mounted by one of the recipients in the base of a glass beaker which was subsequently broken, the medal then being re-mounted in 1560 in a silver-gilt replica. (We are grateful to Professor E. L. Richter for the information on the maker's mark).